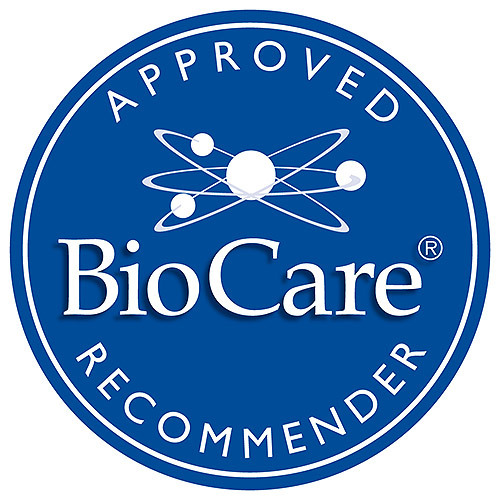 BioCare MicroCell Essential Essential Fatty Acids provides an ideal balance of omega 3 and omega 6 fatty acids from linseed oil and borage oils micellised by BioCare`s unique MicroCell® process ensuring a good degree of absorption and delivery of these fatty acids to the body. Linseed oil, also known as flax seed oil, is a yellowish drying oil derived from the dried ripe seeds of the flax plant (Linum usitatissimum, Linaceae). Linseed is a good source of dietary fibre, omega-3 fatty acids, and lignans. Essential fatty acids (EFAs), such as omega 3 and 6, make up the cell membranes of every cell in the body, and produce hormone-like substances that are important for many biochemical processes, including energy metabolism, cardiovascular and immune system health. Omega-3 fatty acids help maintain a healthy heart and facilitate the utilisation of oxygen by the heart muscle. Omega-3 fatty acids also help maintain the integrity of the epithelial tissue lining the lungs and intestinal tract and the skin. Borage oil is derived from the seeds of the borage (Borago officinalis) plant. Borage oil is found primarily in supplements. Its presumed active ingredient, GLA, can also be found in black currant seed oil and evening primrose oil supplements. However, it is not known whether the effects of these three oils in the body, are the same. Who is likely to be deficient? Many people in Western societies may be at least partially GLA-deficient as a result of aging, glucose intolerance, dietary fat intake, and other problems, though the exact incidence of deficiency remains unknown. People with deficiencies may benefit from supplemental GLA intake from borage oil, black currant seed oil, or evening primrose oil. 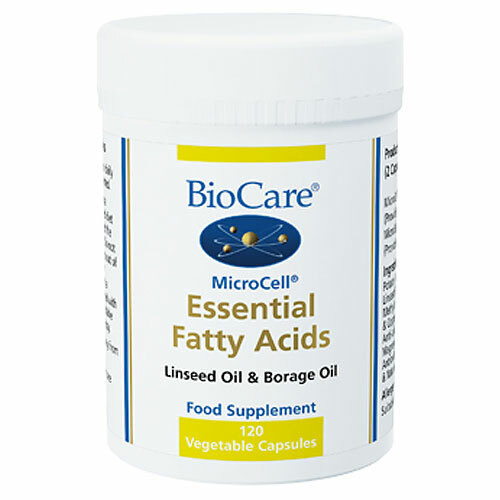 MicroCell essential fatty acids are micellised to improve absorption and bioavailability. Potato Maltodextrin, Modified Tapioca Starch, Linseed Oil, Capsule Shell (hypromellose & Colours (Titanium Dioxide & Copper Chlorophyllin),, Borage Oil, Anti-caking Agents (Silicon Dioxde & Magnesium, Stearate), Lemon Puree*, Antioxidants (Ascorbic Acid, Ascorbyl Palmitate, & Natural Mixed Tocopherols), Sunflower Oil. One vegicap taken twice daily with food or as professionally directed. This product should not be used as a substitute for a varied and balanced diet and healthy lifestyle. Do not exceed the stated recommended daily intake. Do not purchase if the seal is broken. keep out of reach of children. If you are under medical supervision, please consult a doctor before use. Caution is advised with anti-cogulant medication. Not suitable for individuals suffering from epilepsy. Below are reviews of MicroCell Essential Fatty Acids - 120 Vegicaps by bodykind customers. If you have tried this product we'd love to hear what you think so please leave a review. 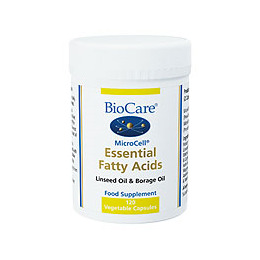 BioCare MicroCell Essential Fatty Acids combines linseed oil and borage oil, which provides an ideal balance of omega 3 and omega 6 fatty acids. Omega 3 and omega 6 fatty acids help to maintain a healthy heart and circulation.